Want to learn the tricks of the trade for one of the most recession-proof careers around? Raleigh Bartending School is North Carolina’s most popular and attended bartending school and has been certifying bartenders for over twenty-five years. Bartenders have fun while making great money. Raleigh Bartending training is set up like a real bar and offers complete hands-on training experience. We have professional, experienced instructors. We help you with earning your bartending certification as well as finding great bartending jobs. You’ll learn over 100 of the most popular drink recipes, alcohol server training, how to set up and break down a bar, and much more. By the time you leave Raleigh Bartending School, we’ll have taught you everything bar, hotel, and restaurant owners are looking for. 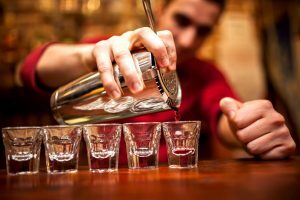 Once you become a certified bartender at Raleigh’s Bartender School, job placement assistance is here to help you get working right away. In fact, it’s here now and in the future. Once you are a graduate we’ll help you find work any time you need it. Raleigh Bartending School offers flexible tuition options and we even have the lowest tuition guarantee. Our 40-hour hands-on course will allow you to become a certified bartender in the Triangle area in 1 to 2 weeks. We’re open 6 days a week and have flexible class scheduling. Raleigh’s Bartending School is conveniently located at 6512 Six Forks Road, Suite 504B Raleigh, NC 27615. Our cross streets are Lynn Road and Six Forks Road. We are North of Lynn Road on the East side of Six Forks Road. Call 919-729-5359 or fill out our contact form for more information.